Give your older cat the delicious flavors of tuna with the essential vitamins they need in 9Lives Plus Care cat food. It's the great taste they want with the nutrition they need to help provide a long, healthy life. 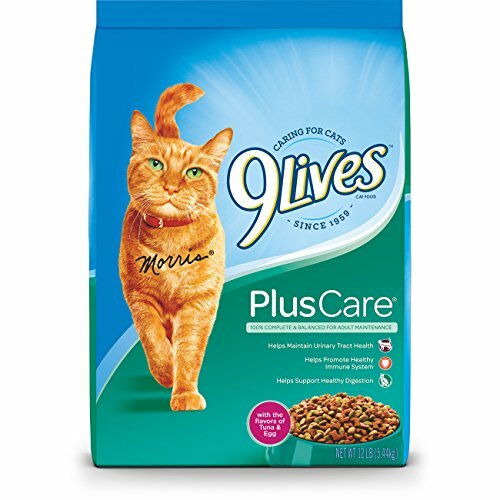 9Lives Cat Food Plus Care Tuna & Egg.9Livesâ ¢ Cat Food Plus Care ® with The Flavors of Tuna & Egg. Caring for cats. Since 1959.100% Complete & balanced for adult maintenance. Helps maintain urinary tract health. Helps promote healthy. Immune system. Helps support healthy digestion. Living well with Morris. We believe your cat deserves to live a long, healthy and happy life. Just ask our favorite rescue cat, Morris.9Lives ® cat food is the only food for Morris because the delicious taste and balanced nutrition help keep a smile on his face and a shine on his coat. For over 50 years, he has made it his mission to share 9Lives ® and spread the word that every cat deserves to live well. Plus Care ®.Healthy, balanced nutrition to help your adult cat thrive! Helps reduce urinary pH. Helps maintain urinary tract health. Vitamin E & selenium. Helps promote a healthy immune system. Dietary fiber. Try all of our great dry flavors. Or mix it up with one of our delicious wet flavors. Calorie content (calculated): Metabolizable energy (ME).3320 kcal/kg: 296 kcal/8 oz cup. Guaranteed analysis: Protein (min. )31.00%; fat (min. )9.00%; crude fiber (max) 3.00%; moisture (max. )12.00%; calcium (min. )1.00%; phosphorus (min. )0.80%; magnesium (max) 0.12%; selenium (min) 0.475 mg/kg; vitamin A (min) 5,000 IU/kg; vitamin E (min) 50 IU/kg; taurine (min) 0.10%.Nutritional statement: animal feeding test using AAFCO procedures substantiate that 9Lives Plus Care ® dry cat food provides complete and balanced nutrition for adult maintenance. Contents filled by weight and not volume. Some settling of contents may occur during handling. Packed with pride in U.S.A. Questions or comments: Visit our website at www.9lives. com or call 1-888-4-9LIVES (1-888-495-4837) weekdays, with the information contained in the "best if used by" date box. www.9lives. com. © Big Heart Pet Brands. All rights reserved. Last updated: April 18, 2019 at 11:27 EST. Pricing information is provided by the listed merchants. GoSale.com is not responsible for the accuracy of pricing information, product information or the images provided. Product prices and availability is subject to change. Any price and availability information displayed on amazon.com or other merchants at the time of purchase will apply to the purchase of the product. As always, be sure to visit the merchant's site to review and verify product information, price, and shipping costs. GoSale.com is not responsible for the content and opinions contained in customer submitted reviews. Coupon Details: Select 'Subscribe & Save' and add to your cart to save 5%. You can cancel the reoccurring subscription after the order is placed within your Amazon account settings.